On the feast of St. Andrew, the apostle to Byzantium, an update on his legacy. At night, the Hagia Sophia is invested by wild dogs. 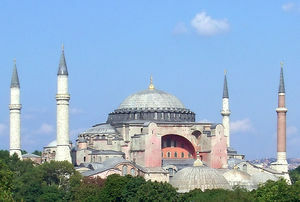 You walk about the expanse between it and the Blue Mosque, and you pull your coat tight against the early winter chill. The dogs are everywhere. They are in the streets, lolling contentedly as the odd taksi veers about. They are on the concrete, rummaging through strewn trash. They are on the grass, rooting about in the flowers, and gnawing upon disgusting chunks of rancid flesh. They ignore you. One of them barks, and at once they are all on their feet and yelping. They lope toward a solitary taksi driver who performs a small charity of sharing some meat. Overlooking it all is the Hagia Sophia, red stone capped with black metal, topped with the golden crescent of its conquerer. It is massive. Chronicles of the Dark Ages and the Medieval era tell of Western travelers seeing the Queen City for the first time, and being stupefied at its grand church. And so I am, as Sunday slides into Monday in the dead of a Constantinopolitan night. The hulking form overpowers the grace and grandeur of the Blue Mosque, a park's length away. The great mosque apes the great church, except it is white instead of red, its minarets are native instead of alien, and its believers are thriving instead of dying. The Christians of the Queen City are dying. The Ecumenical Patriarch housed in the Fener district used to be ecumenical – an Orthodox Christian, to be sure, but of no particular nation. No longer. Because the Patriarchs of old lived with the Emperors in their very city, they grew accustomed to the strictures of state power – unlike the Popes, who exercised temporal monarchy of their own. The Sultans of the Ottoman Empire saw fit to continue the relationship, reaping handsome profits from bribe-profferring claimants to the Patriarchate, and forcing the occupant of the seat of St Andrew to answer for their co-religionists. 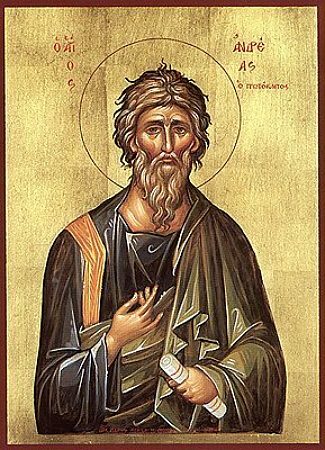 Usually this entailed a conferral of a limited intra-communal civil power upon the Patriarch; but in the Greek War of Independence, the Patriarch was lynched for his rebellious millet's temerity. As with the Sultans, so with their successors: the Turkish state continues to dictate the terms of existence for a Patriarchate that predates the mere existence of Turks in Turkey by at least seven hundred years. Who could have imagined that this might happen to one of the great centers of Christian life and culture? Could it happen to St. Peter's in Rome ... to Notre Dame in Paris ... ? If it ever does, it will be due more to the loss of faith in the West than to the ferocity of its external enemies. Olivier Clement wrote very profoundly about the invisible benefits of the ruin of Byzantium. In “Dialogues avec le patriarche Athenagoras” (still not translated into English), he notices that there has been an “internalization” of Byzantium, its theological, spiritual and artistic aspects, in the heart of the faithful. I feel it is becoming even more true today among some orthodox Christians. Worldly success comes like a Trojan horse in the history of the Church, East and West. I am privileged to meet eastern Christians, whether orthodox or catholic, who live their tradition at a personal level, and with an appreciation of its centeredness on the imitation of Christ in His humility at its center, who are better witnesses than an institution can be because of the very nature of institution. The beautiful pages by Clement about the experience of space and light while walking in modern Hagia Sophia encapsulate this.